The wind roaring in my ears made thought difficult, even with my eyes squeezed shut I could feel the speed of the pavement rushing by beneath the twin wheels. I never should have given in and gotten on this thing that first time. Gritted my teeth and tightened my arms around his waist, listened to the chuckle the wind blew back past my ear and frowned mentally. The man had a faintly sadistic streak, he loved being able to get me to do this as much as he knew I didn't like it. At least I could take comfort in the knowledge that, unlike that actor he looked so much like, D had never had a wreck. And he only owned one of these things, thank the Gods, a nice ordinary Harley hog. Of course I didn't like the Porsche much better, not enough vehicle around me and way too close to the road. Bumpy ride on top of it. Realized that the wind wasn't quite as noisy nor the speed what it had been, and opened my eyes a fraction as movement nearly stopped all together. No, not yet, he was just slowing down to make a turn. The road's name sign was behind us before I absorbed the words. Merlot Lane. We were almost there. The gravel had slowed him down at least, and I relaxed a little more, kept my eyes open. It was nice here.. a suburb of a suburb of the city. Vinyard Estates wasn't new and places here didn't come up for sale often, but D had heard about this one from a director friend ; lots of artsy types made their homes out here apparently. New Orleans seemed a long way away from New York. It was even a long way away from where I'd lived here before, up in the north western part of Louisiana. People living here often said that the difference between the two halves of the state were night and day. Not just the topography but the people. The atmosphere. The very air. A light helmet bump against mine pulled me out of my thoughts. This man I was wrapped around. Over two years. That I had been watching him come and go, he really did have the wander lust. Maybe he was part Gypsy. I was a homebody myself, content to putter around the apartment, take my short walks to the grocer, the little corner deli, the park. I'd done my roaming in my younger years. It would be different if we did move here. The nearest anything was nearly ten miles distant, I'd have to get a car. But still, the thought of not living in my neighbors' pockets was attractive. 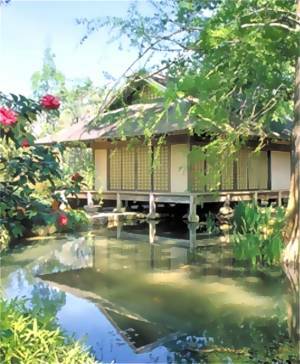 He slowed to make another turn into what was clearly a private drive, the small wrought iron sign read Lotus Cottage. It was affixed to a stone pillar, two of which flanked the drive, the other held an alcove containing the mail box. A moment later the overarching trees gave way to a small clearing and I actually sat up straight without thought, enchanted by the scene, forgetting the bike I sat on altogether. I had been cooped up in the city too long I realized suddenly, I'd missed this. Had I consciously suppressed the longing? The bike rolled to a stop and the engine faded into silence. Human silence at any rate, Nature's noise was in full swing. Birdsong, insects, the wind in the tree tops and the sound of water, I could smell that, a bayou maybe. A small cottage sat across the clearing, maybe an acre or so, surrounded by trees for the most part. Whitewashed, a wide front porch, un-railed, with two broad concrete steps and a porch swing at one end. Sliding glass doors flanked by two wide windows with deep sills. "Well?" D's patient query distracted me and I glanced at him with a raised brow as I stood up and swung my leg around to dismount the bike, stood still for a brief moment to make sure that I wasn't going to hit the ground if I took a step. How did people ride these things for miles, day after day? D was grinning as he stopped in front of me and unstrapped my helmet, having already removed his own. I clamped my lips shut, determined to not say anything, but he knew damn him, I could see it in his eyes. He knew I liked it. What had happened to the poker face I'd always been so good at? Or was it just D? Turning my attention back to the cottage I walked across the short distance to the steps, up the two and then listened to the sound of my footsteps on the boards. Four by sixes maybe, they both sounded and felt solid. I wondered if Katrina had had any effect here? Why had the owners decided to sell? He could have been reading my mind "It's in good shape, only four years old, her husband died and she sold out to move back closer to her family. Here.." I looked down at his hand, the key ring he was offering. Looked up into familiar eyes, the gleam of pleasure there. Yeah, he knew. Sighed and took the keys, found the one that fit the lock and pushed open the door, the scent of Pinesol and fresh paint wafting out. Stepping over the threshhold I moved inside far enough to make room for him before I stopped again to look around. It was small and yet airy, light, the windows letting in morning sun that washed across hardwood floors. One large room, to the left the kitchen, on the right the living area. A fireplace and mantle incorporated into wall long and tall shelving on one end. I turned to the kitchen, inspecting the appliances critically. They appeared to be nearly new, inset into counter space and cabinets along the front wall and that opposite the fireplace wall. Fully appointed, even a trash compactor. Along the back wall were two sets of folding doors, behind which I discovered a washer and dryer and a pantry. I closed the second set of doors and turned around to look over the rooms again. Sixteen by twenty four? No, not a big place.. but still. Eyed D, who still stood by the front door, hands in his pockets and an expressionless face. But those eyes. Shook my head, resisting a smile and turned to head for the small hall that was centered in the back wall of the rooms. On the right was the door into the bath and I paused there for a moment, staring at the tub against the outside wall. Stepped over for a closer look, a spa tub, the basin was fully six feet in circumfrence and probably two feet deep. And the wall behind it was glass.. lightly frosted fortunately, privacy but plenty of sunlight. Knowing he was standing in the door behind me I looked over my shoulder and accused "You've already been here to look." He wiggled his brows and I snorted softly and shook my head again. The door on the other side of the hall opened onto a small utility room, contained the water heater and a central heat and air unit, some shelving for storage. Knuckles rapping on wood drew my attention and I turned to see D tapping on the door at the hall's end, that would have to lead to the bedroom, it only had one. As I came back to his side he opened the door and I peered in. And blinked. I'd been able to smell it in the air but with all of the trees hadn't been able to see it from out front. This was why he'd brought me here. This was why that look in his eyes. This was why he knew. Stepped past him and into the room, walking on across to the far wall. The room was pure light coming from three sides, wide shoji screen doors, at least I thought that's what they were called. A small deck only wide enough to walk on was all that stood between the bedroom and the bayou. I couldn't even imagine waking up in here everyday.. The Spanish moss festooned trees, the long grass growing on the banks, the exotic flowers blooming and the gentle lapping of the water against the pillars the cottage stood up on. Turned the lock and pushed open the doors in front of me and drank all of that stuff in. Heady brew. I took a moment to study the doors, rather than rice paper, or whatever was commonly used, the panes were etched glass, proof against the weather I supposed. The roof's overhang was broad, but blowing rain would still reach the doors. Pulling my gaze away from the scenery again I turned around and considered the room thoughtfully. It was roughly the same size as the living and kitchen were, and there was no closet. Not a problem of course, there'd been furniture to store clothes in before closets had been thought of. Plenty of room for both bedroom furniture and a desk for my computer stuff. Maybe even two desks, one for D, although I knew what he'd end up doing, he'd never cared about having a desk, just a file cabinet to keep his scripts in. Looked back at him now "The place in New York?" "Keep it of course." "Support two households." I commented just for the hell of it, watched him make a face and suppressed another smile. I still wasn't used to his money. It was hard to think about when he looked like a derelict - hence my nickname for him - and hung out in coffee houses with his screen writer buddies. "You want to do this." I didn't quite question and he rolled his eyes. Of course, we wouldn't be here otherwise. A man of few words, but all you had to do was pay attention. I finally smiled and walked back across to him, slipped my arms around his waist and tilted my head back as his arms circled me. He bent his head and pressed his nose to mine, waiting.